As a homeowner, you will want to do what is best for your old property. To keep your windows looking good and in working order, you should know all about sash window refurbishment. Sometimes restoration is better than replacement, especially if your windows are historic. You rarely need to spend lots of money on repairs once you find out the cause of the problem. To start assessing your existing character windows, you should first figure out why it is necessary to repair them. Sash windows were made in the 18th and 19th centuries. These units have always been successfully repaired using the latest methods. When you take a look at listed buildings, you will see that their historic windows have lasted for centuries. If your units are over a century old, it is now time to add value to them and restore them back to their original condition. Historic windows have been made by skilled joiners who used high-quality wood that lasts for generations. This is the reason it is recommended by window specialists that you leave the task of maintenance to professionals. If wear and tear is your main concern, a good joiner can rectify this problem. For major repairs, you may need to set a budget as the costs will be more or less the same as complete replacement. However, historic windows have long proven their durability by lasting for centuries. With adequate care, they will outlast any modern unit. To test the condition of the timber frame, take a knife and penetrate it into the material. It is normal for the blade to go into the timber by about 3mm. If it goes even deeper, then the wood material has dried up and requires oiling. However, if the knife penetrates more than 6mm, this indicates signs of decay. Look around the sills, rails, and lower corners to check the condition of the frames. Most sashes are very difficult to open or close. If this sounds like the problem you have, it could be due to broken or damaged cords. Also check for paint build-up that may have caused the friction. Most often, it is a combination of several factors that make sashes difficult to open or close. Every part of the unit needs to fit snugly together in order to function properly. Wood can be sanded in cases where there is a jamming. It is important to remember that if the unit rattles or makes a noise, it means you have removed too much timber. To protect the frames, you must apply two coats of paint that is made from pigment, binder, and additives. Each coat should be applied at regular intervals. This will keep the rain out and protect the wood from cracking. As a rule of thumb, paint normally lasts for up to five years depending on the location of your home and weather conditions. Even if the timber has been damaged, this does not mean that new paint has to be applied. You should ask for professional advice from a skilled joiner who can assess the condition of the paintwork and advise further. The most basic factors that you should bear in mind when deciding whether to repaint the frames or not include the peeling or cracking that comes off in large segments. If you see exposed and bare timber, you should remove the rest of the paint and start again. Similarly, if the paint is bubbling or lifting, it may mean that the previous coat was applied on an oily or wet surface. It is, therefore, important to take your time and assess the condition of the paintwork before proceeding. On the other hand, if the most recent layer is peeling but the paint underneath is in good condition, then you can simply sand it down and apply new paint over the cracks or scratches. Take care not to cause any further damage to the corners, especially if the glass is broken. 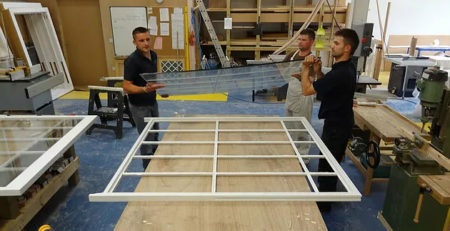 If so, the individual pane must be removed by an expert. Only reuse the historic glass if it is not broken or cracked. Never repair old windows for the sake of retrieving the glass. You may end up with broken panes of glass and timber sticks. To prevent this, make sure you contact specialist joiners in your area to carry out the refurbishment.